Tea lover or coffee addict, you'll find something to enjoy while you catch up and chill with the whole barkada in Greenhills, Ortigas, or QC. Conversations are often exchanged best over coffee—or just anything yummy to sip. Even better if you have something delectable to munch on. If you're not really into coffee, or would simply love to enjoy healthy and delicious interesting treats while you catch up with your friends, then we suggest you try this fun new hangout. Bubble Tea Restaurant (Tokyo Milk Tea Place), is a cozy and relaxing, Japanese cafe-inspired restaurant that serves premium milk tea and a selection of Japanese fusion dishes. It recently opened a branch in Wilson, Geenhills, but also has branches in Megamall, The Block in SM North Edsa, and Tomas Morato. CEO Raegan Tan thought of creating Bubble Tea after taking up culinary studies in Canada and working at hotel kitchens there. He came home to finish his Mechanical Engineering degree at De La Salle University, when he found himself missing the bubble tea in Canada, where, instead of going to coffee shops, they would usually go to bubble tea restaurants. He decided to bring the concept right home to Manila so we could enjoy it! It just so happened that Tan also loves Japanese food, hence the incorporation of Japanese fusion food, which actually goes well with the milk tea. Bubble Tea Is Different From "Pearl Drinks"
Where as pearl drinks (which were a rage a few years ago) use artificial flavorings and artificial powder, Bubble Tea is premium milk tea, using natural, first class Japanese ingredients and high caliber tea. It's brewed daily, and everything is made fresh from the finest ingredients upon order. They boast of the best soft chewy bubbles, too, making Bubble Tea drinks not only healthier but tastier! Cosmo recently visited the Wilson branch, where we got to try their bestseller, the Royal Milk Tea (P115 for a medium, cold), which combines black tea and milk. You can also try their many other interesting flavors such as Jasmine, Almond, Japanese Green Tea, and even Taro. If you want something without dairy, you can also try their Tea Slush (P123 for a medium) that comes in various fruity flavors like Kiwi, Strawberry, and more. On your first visit, try both types of bubbles; but as you try more drinks and discover your favorite, you can also opt to ask for just big or small bubbles, depending on your preference. To go with your beverage, Bubble Tea serves Japanese fusion food—Western food prepared the Japanese way (read: with Japanese flavors). Many of their dishes are only available in Bubble Tea. The main menu is continuously developed by Tan, while his wife Aileen is in charge of the pastry section. Orders take a bit of time to get to your table, but that's because everything is prepared fresh. Their dishes ought to satisfy you and your friends, since most of the servings are big enough to share. Try these popular Bubble Tea dishes with the whole gang. Say, you've just finished a workout sesh at the gym with your office buddies, why not go for something light and refreshing? Try the Japanese Caesar Salad (P195) that comes with a sesame dressing and generous helping of garnish. Or reward yourselves with something more indulgent (and a little on the safe side, for those afraid to experiment) like the Japanese Fried Chicken in a Basket (P385) for four pieces of juicy Japanese chicken. This is also refreshing with its nori ginger sauce and sweet yakiniku sauce, and made more filling with its yummy side dish of Japanese potato salad. For some Western-Japanese fusion food, try the best-selling Japanese Chicken Leg Rice (P245), which is Japanese-style chicken deep-fried to perfection and served with juicy sauce, garlic rice, and sidings. If you're craving something classic with a twist, go for their best-selling Tori Pesto Spaghetti (P265) which is pesto cream sauce pasta topped with pan-fried yakitori chicken. The Yakiniku Beef Sandwich (P245) is also a filling treat, made with grilled USDA Beef with yakiniku sauce, cheese, tomato, onion, and lettuce. We also recommend the Mixed Seafood Yakimeshi Rice (P155), which is actually a meal in itself, as the fried rice has tuna, salmon, ground pork, and mixed vegetables in it. Pizza is always a fave barkada treat, but we dare you to try it Japanese style! The popular Okonomiyaki Pizza (P215) is made authentically at Bubble Tea and gives you a unique take on the meat and vegetables pizza, topped with mayonnaise. If you're truly in the mood for Japanese, we suggest the Nippon Ebi (P285)—breaded prawn rolled in sushi rice, topped with mango on melted mozzarella (yum!) --and the Vancouver Maki (P285). Salmon lovers will relish the delicious Salmon Foil Yaki (P345), a sweet and flavorful Tokyo entree, perfect for sharing. If you're looking for a new spot to hold your business meetings, the new Bubble Tea branch in Greenhills is spacious and has a function room at the second floor that can accommodate 30 people. (They even provide a free projector and mic!) 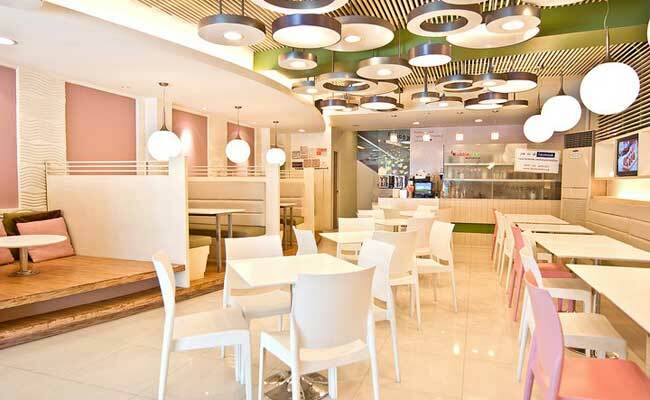 All Bubble Tea branches offer free WIFI access for diners, so you can dine and work (tsk, tsk!) in this cozy, Japanese-style restaruant. Visit Bubble Tea at tokyobubbletea.jp or facebook.com/tokyobubbletea, or e-mail them at tokyobubbletea@gmail.com. Bubble Tea has also partnered with City Delivery for delivery service. You can order via www.citydelivery.ph or 87878.